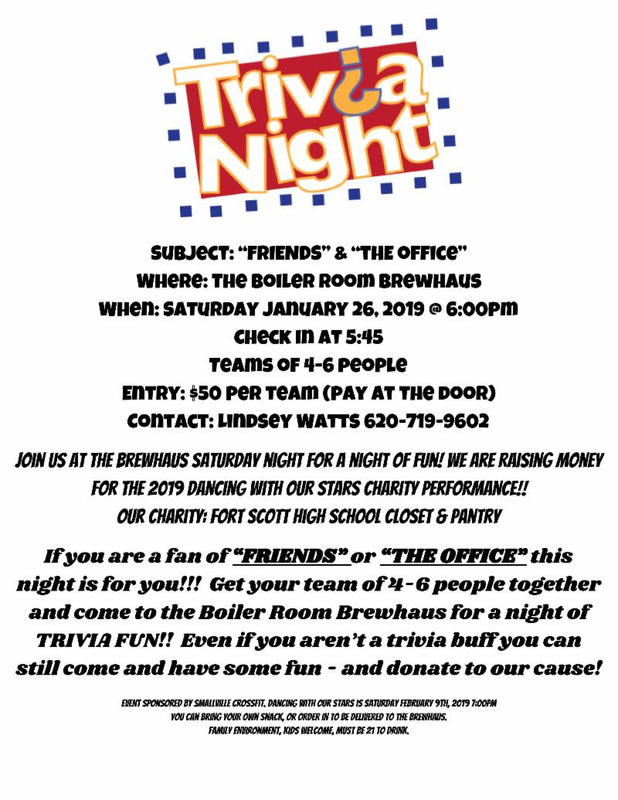 Join us at Boiler Room Brewhaus for a night of Trivia Fun!! 10 S. National Ave. in Fort Scott. We are raising money for our “Dancing With Our Stars 2019” charity performance. Our charity is Fort Scott High School Clothes Closet and Food Pantry. 4-6 people together ($50/per team at the door) for a night of trivia fun. Even if you aren’t a trivia buff, you can still have some fun, and donate to our cause! You can bring your own snacks or order in to be delivered to the brewhaus. Family environment, kids welcome. Must be 21 to drink. Contact Lindsay Watts at 620-719-9602 for more info.